Then we have another variety which necessarily may not always make you smile but definitely grabs attention. 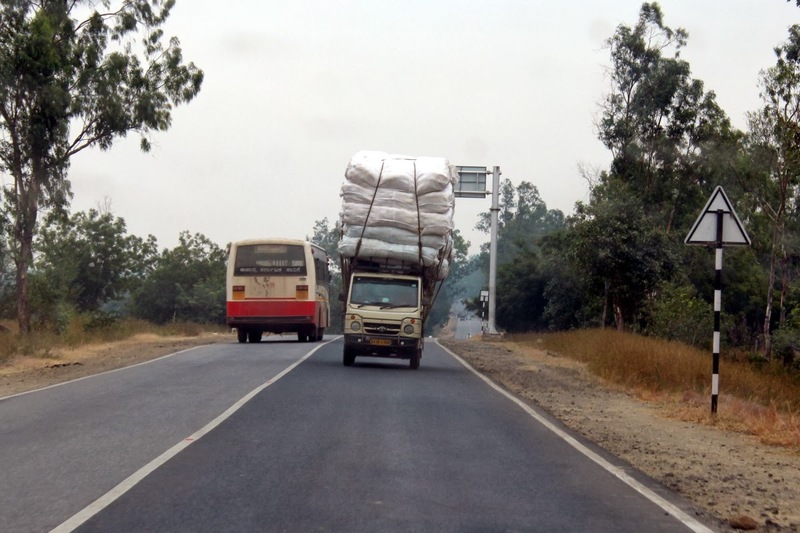 Overloaded vehicles are quite common on our roads.. bullock-carts, bicycles, motorbikes, scooters, tractors, mini-trucks. Here're few I managed to capture. 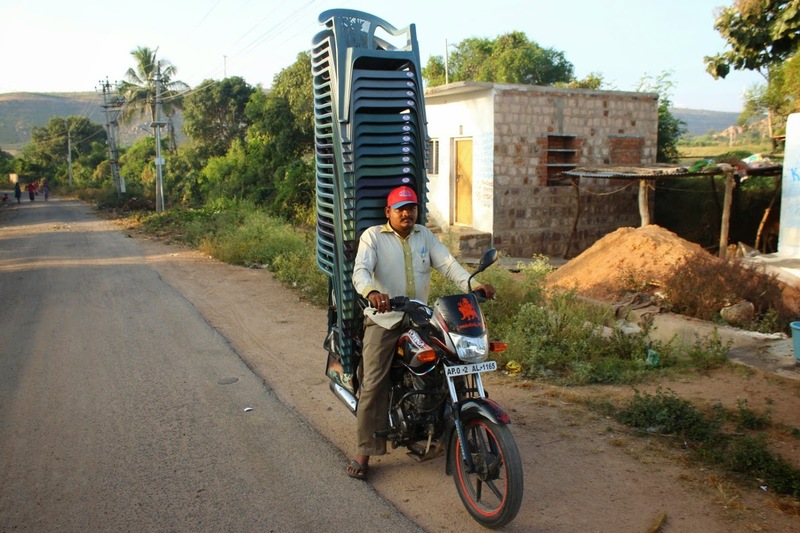 On our way to Gajendraghad, we happened to follow this bike loaded with a stack of 27 chairs. The biker pulled over at the first opportunity to let our cab overtake. This is not safe and definitely illegal but one has to admire his courage. Another time, I've seen a pillion rider holding on to three 4' diameter 20' long PVC pipes. Vertically. What all people do to save money. Next we have a mini-truck overloaded with some kind of light but voluminous material. This was some where between Malkhed and Gulbarga. The cargo height is easily one and half times the truck height. Its quite common to see such trucks overloaded with all kind of cargo.. barrels, empty tins, plastic pots, hay, sacks with puffed rice and what not. What does the driver do if it gets windy suddenly. Scary thought! Here's a short video of a mini-truck loaded with plastic pots seen on Dharwad-Navalgund road. ..and a truck with tipping cargo. Many a times, while traveling in rural areas, tractor trailers loaded with hay or wheat chaff are a wide as the road itself. We'd to follow the tractor at its snail's pace for a kilometer or two until a relatively spot was found. Well, happy and safe journeys. Nice Sid, These things we see in rural India but undocumented. What to see in Koppal district?